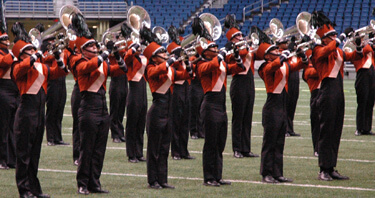 Drum corps experience: Mandarins 2006 (baritone) What is your favorite drum corps story? The very first performance this season. It was my first experience on tour, and I had a good show. What is your favorite moment in your show? I like the musical tag at the very end. The energy there is really nice. What made you choose the Mandarins? My brother was a member in 2002 and 2003, and he convinced me to join. What do you miss most from home? My parents. Do you have any particular challenges being so much younger than the other members? I suppose my maturity level could be considered a little less. Sometimes it makes it a little harder to connect. What were you most looking forward to before tour? When we're in Wisconsin for the World Championships. I know it's going to be the best part of the whole tour. Anything else you want to say? Hi to my mom, dad and my brother, Greg!